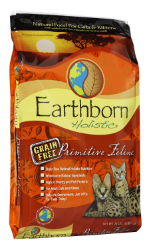 Formulated to provide high protein nutrition with a taste your cat will love. Along with protein, there is a healthy mix of vegetables and fruits, which contain natural antioxidants important for everyday optimal health. Vitamins and minerals help support your cat's immune system. This grain-free diet is a healthy alternative and is sure to be one your cat will enjoy. Quality animal and fish proteins such as turkey meal, chicken meal, herring meal, salmon meal and whitefish meal help build and maintain lean muscle mass. Balanced levels of calcium and phosphorus help build strong bones and teeth. Guaranteed levels of antioxidant nutrients like Vitamin E and Vitamin C blended with nutrient-rich vegetables and fruits such as peas, apples, blueberries, carrots, spinach and cranberries help support the immune system, good digestion and intestinal health. Made without grain or gluten, this special formula is perfect as a grain-free alternative diet. 3,925 (M.E. Calculated, as fed) Kilo-Calories per kg/430 (M.E. Calculated, as fed) Kilo-Calories per cup. Turkey Meal, Chicken Meal, Pea Protein, Chicken Fat (preserved with mixed tocopherols), Peas, Potatoes, Dried Egg Product, Herring Meal, Salmon Meal, Ground Flaxseed, Pea Fiber, Natural Flavor, Sweet Potatoes, Whitefish Meal, Blueberry Fiber, Cranberry Fiber, Choline Chloride, Apples, Blueberries, Carrots, Spinach, Cranberries, Canola Oil (preserved with mixed Tocopherols, a source of Vitamin E), Taurine, DL-Methionine, L-Lysine, Potassium Chloride, Calcium Sulfate, Vitamin A Supplement, Vitamin D3 Supplement, Vitamin E Supplement, Zinc Sulfate, Ferrous Sulfate, Niacin, Folic Acid, Biotin, Manganese Sulfate, Copper Sulfate, Calcium Pantothenate, Thiamine Mononitrate, Pyridoxine Hydrochloride, Riboflavin Supplement, L-Ascorbyl-2-Polyphosphate (source of Vitamin C), Zinc Proteinate, Manganese Proteinate, Copper Proteinate, Calcium Iodate, Sodium Selenite, Cobalt Carbonate, Vitamin B12 Supplement, Yucca Schidgera Extract, Rosemary Extract, Dried Lactobacillus Plantarum Fermentation Product, Dried Enterococus Faecium Fermentation Product, Dried Lactobacillus Casei Fermentation Product, Dried Lactobacillus Acidophilus Fermentation Product.